The 8th stop on the “Domain Island Tour” is Cyprus. 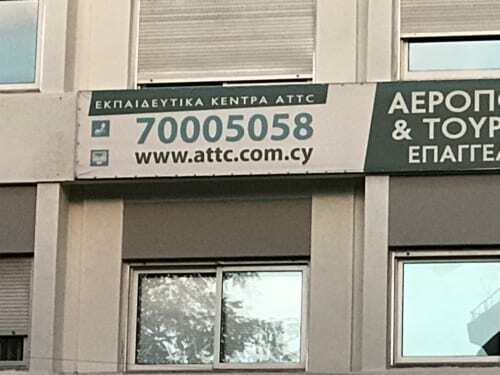 The ccTLD (country code top level domain) for Cyprus is “.com.cy“. The island of Cyprus is located in the Eastern Mediterranean, along the coast of the Anatolian Peninsula of Syria. It is the third largest island in the Mediterranean, after Sicily and Sardinia. 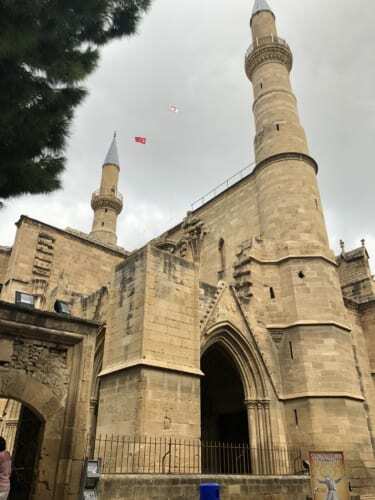 The island of Cyprus is divided into two parts, in the south, Cyprus (the Republic of Cyprus), and in the north, Northern Cyprus (the Turkish Republic of Northern Cyprus). The ccTLD (country code top level domain) for Cyprus is “.com.cy”, but as Northern Cyprus has no country code, a ccTLD is not assigned. 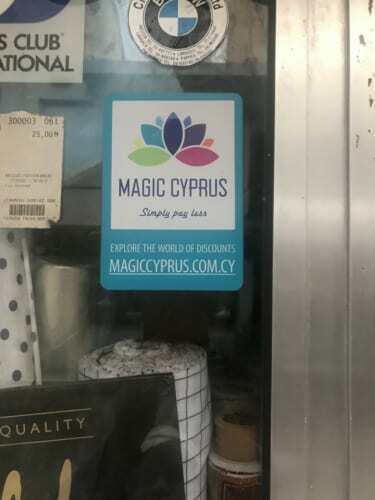 Travelling around Cyprus, famous for Bitcoins, and Northern Cyprus, about which very little is known. 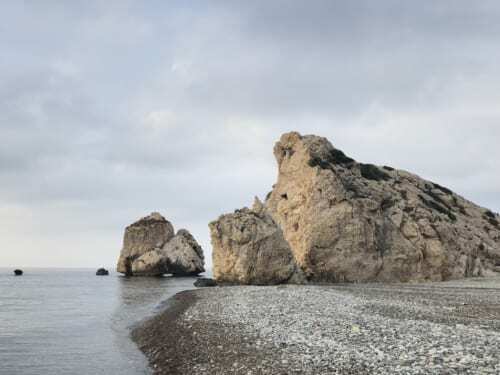 At 5:30 in the morning, I start driving towards “Aphrodite’s Rock”. At 6:00, I park the car in the parking lot opposite the coast, and walk to the coast. There is a restaurant by the parking lot, but it’s not open yet. The public washrooms are to the right, facing the restaurant. They were open. The walkway heading to the coast. 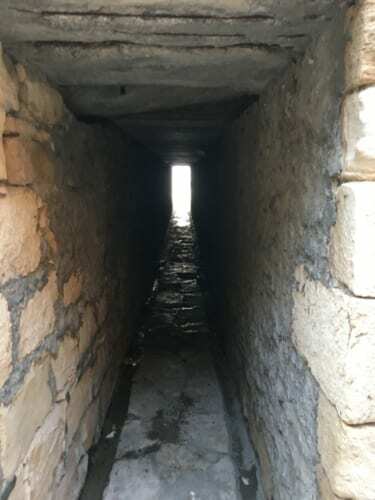 A small stone tunnel just before arriving at the coast. Here we are. 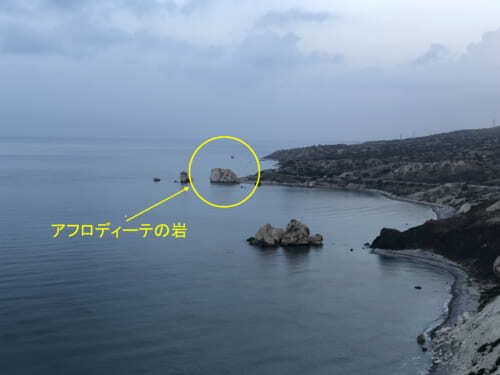 This is Aphrodite’s Rock. This was the exact spot where Venus was born. I thought it would be sandy, but it’s a pebbly beach. A place where the sea is so beautiful and people can enjoy swimming, it’s usually very crowded with tourists. As it was early morning, there was only one group of tourists besides us. 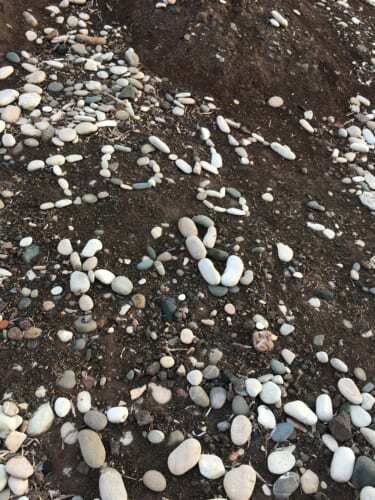 They say that if you find a heart-shaped pebble on this beach all your dreams about love will come true. But I couldn’t find any heart-shaped pebble. It seems that those who want all their love dreams to come true write messages on the stones or make messages with the stones. 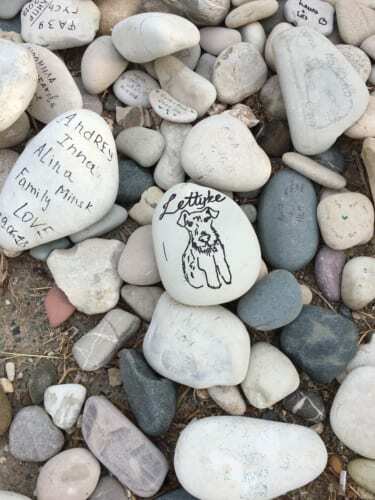 There were even stones that expressed love for pets. This is a power spot for love. Another name for Aphrodite is “Cypria”, and this reminded me of the “Legendary Warrior: PreCure” (pronounced Purikyua in Japanese). PreCure is a combination of “Pretty” and “Cure.” Some Japanese people claim that the name of PreCure comes from Cypria (Kypria), but this has officially been denied. 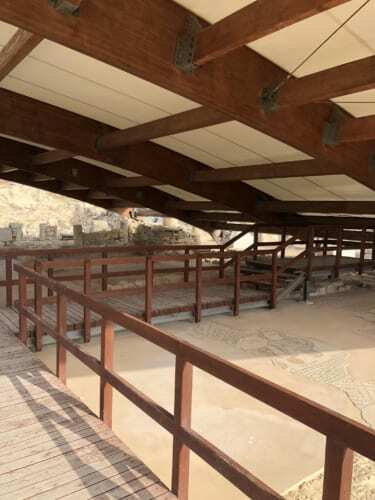 Located in the southwestern part of Cyprus, the ruins of the ancient city “Kourion” are situated on an elegant hill where you can see the ruins of Hellenistic times, Roman times and early Christian times. The entry fee is 4.50 euros. After passing the ticket office, you immediately come to the Roman amphitheater (The Theater.) This theater was built in the 2nd century BC and collapsed in an earthquake in the 1st century. Later, it was rebuilt between the 2nd half of the 1st century and the 2nd century. In an area furthest from the Theater, I discovered the waiting room for the strongest of humanity in RPG (role playing game); Gladiators (The House of the Gladiators). 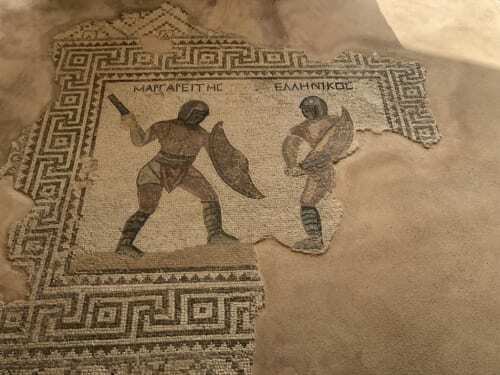 Here is a mosaic that depicts battle scenes of Gladiators. 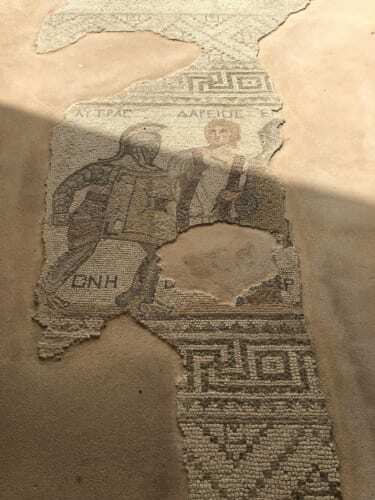 The ruins have been given a roof to protect this mosaic. 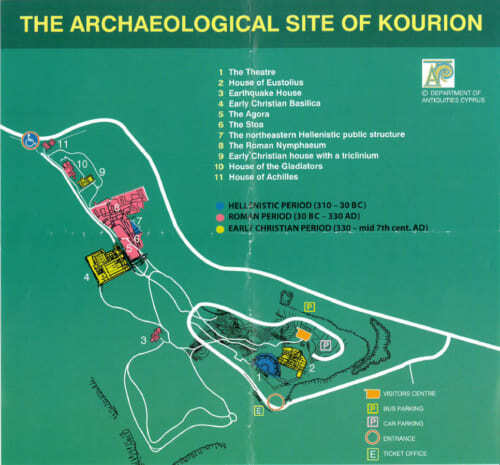 There are 11 sites in the ruins of Kourion and it takes about an hour and a half to see them all. This day was sunny. It was very hot. I recommend bringing a drink. 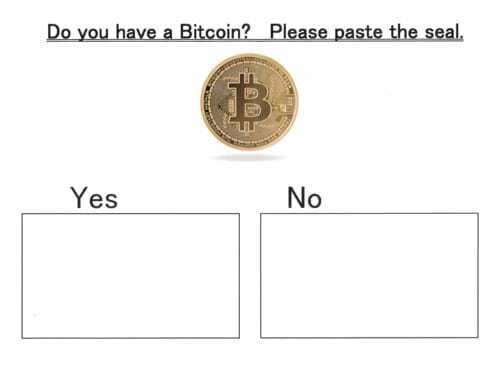 As our company loves making questionnaires, (see our past questionnaire on Japanese idols “JapanExpo” (Paris) we decided to make a questionnaire to find out how many people in Cyprus own bitcoins. 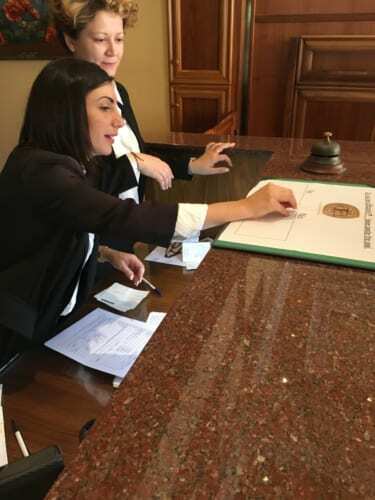 First, I asked the two ladies at the front desk of the Hotel. 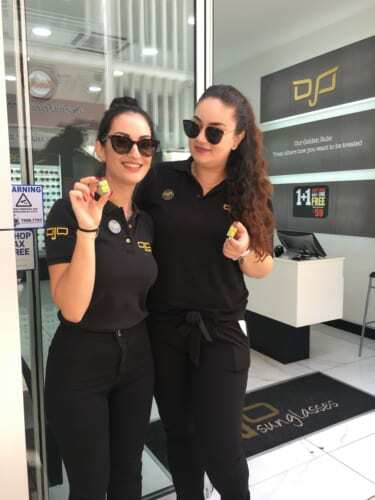 Next, two ladies working as clerks in an eyewear shop. They happily let me take a picture of them with the Pikachu gum I gave them in thanks for filling out the questionnaire. However, all four of these ladies didn’t own any bitcoins. Maybe they are too young? 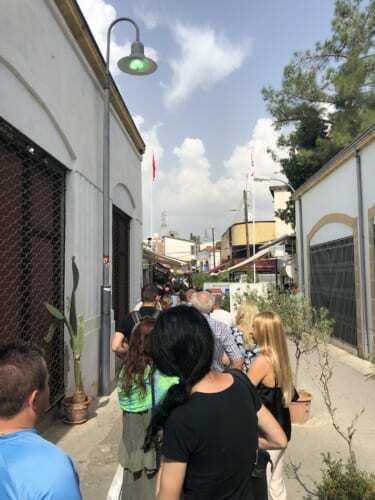 I took the questionnaires to Ledra Street and walked around to the different shops, there are restaurants, fast food places, clothing shops, souvenir shops etc. 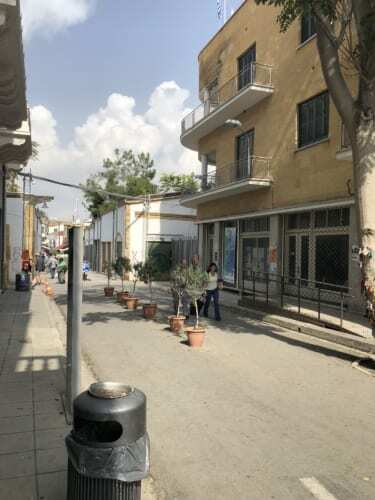 Ledra Street is the main street of the capital Nicosia. There were plenty of shops for “Otaku” (geeks). 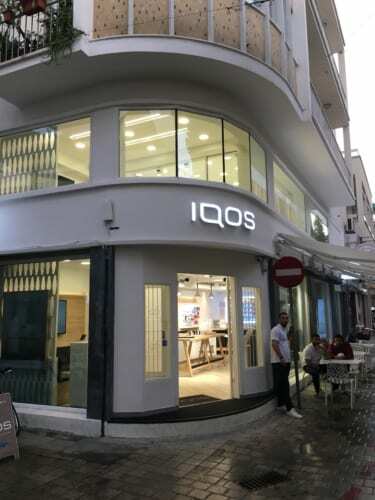 An IQOS shop in an alley off Ledra Street. In Cyprus its ok to smoke e-cigarette. 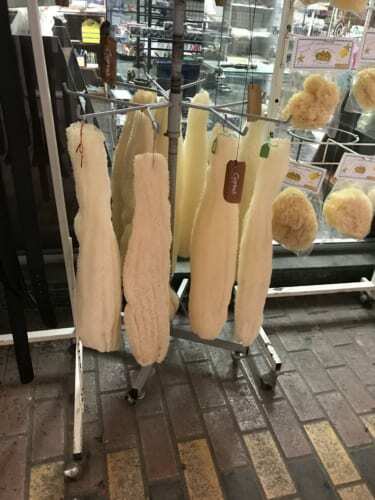 There was a shop selling loofahs off another side street. Huge! 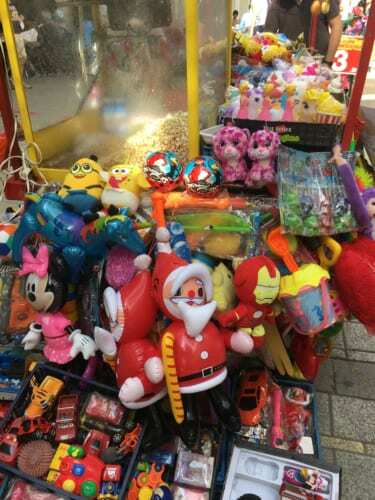 The price for the one on the far left is 4.80 euro. 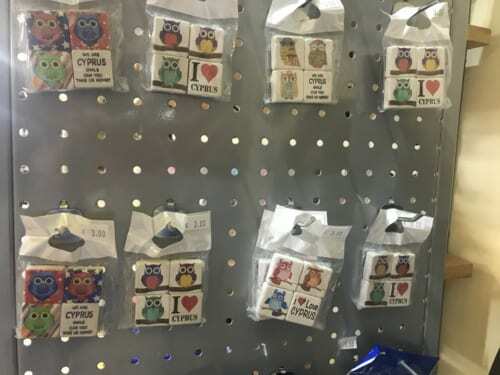 As Cyprus has many ethnic Greeks, they sell many items with symbols of ancient Greek knowledge, like these small owls etc. 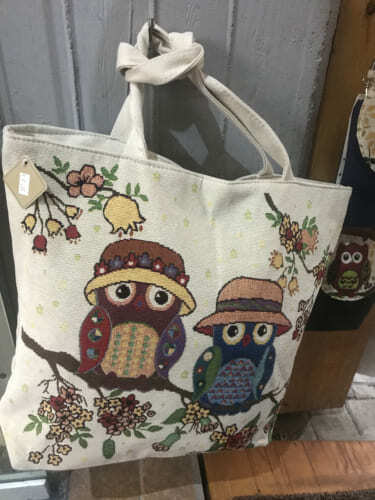 The cute owl tote bag is 7 euros. 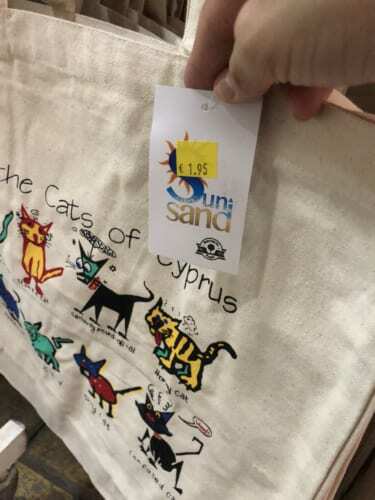 The cute cat tote bag is 1.95 euros. 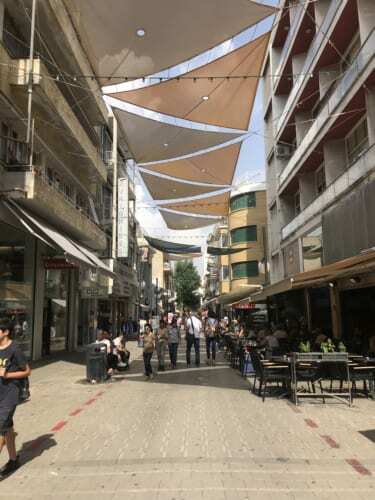 Ledra Street and its alleys contain many fun places to shop. 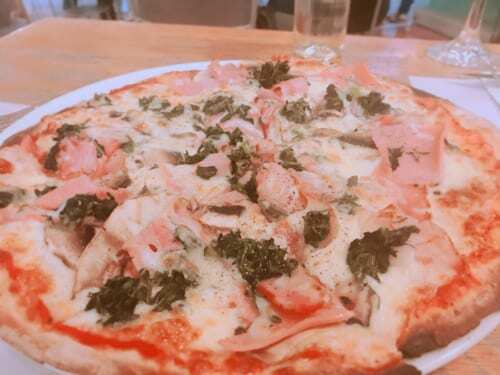 I got hungry so I went to an Italian restaurant, “il forno”. I ordered quattro stagioni (12.60 euros) and coffee (3 euros). I asked the waiter if he owned bitcoins. “I don’t have any, please give me some!” he answered back. 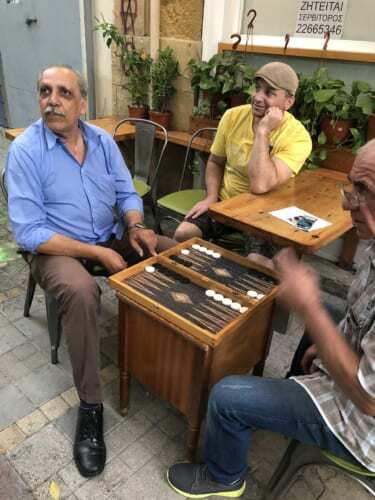 This waiter told me that during the financial crisis, bitcoins, which at the time had little value, were distributed for free on Ledra Street. I found that hard to believe. No matter how many times I asked, he said “it’s true!” The quattro stagioni was lightly seasoned compared to in Japan and very delicious. 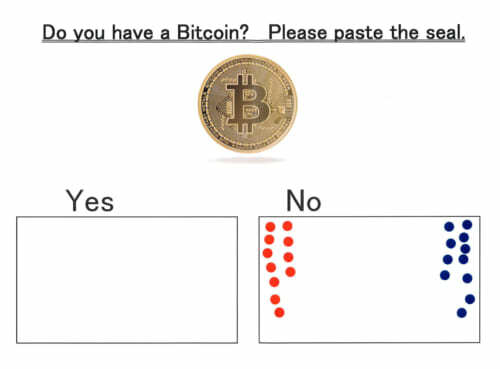 In the end, I asked a total of 23 people, but not one of them had any bitcoins. Though, if they did own some, they might not want to admit it to a strange Japanese man who turned up and suddenly started asking questions. 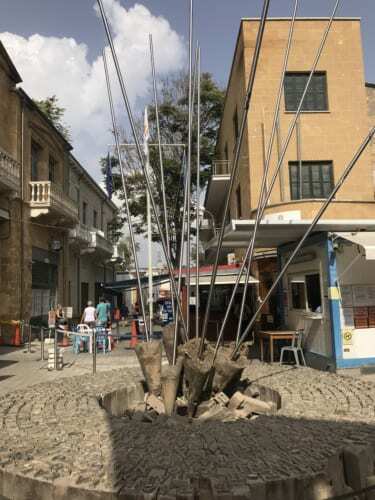 If you head north on Ledra Street, you will find a green line that separates Cyprus from Northern Cyprus. 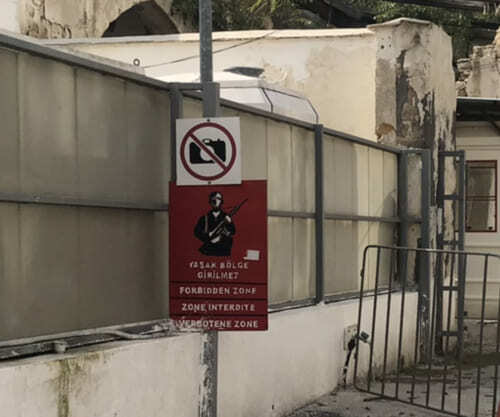 This is a buffer zone (ceasefire line), drawn by the United Nations in 1974 to stop the conflict between the Greek residents of southern Cyprus and the Turkish inhabitants of Northern Cyprus who were seeking separation and independence. Before the border checkpoint, there is a monument to commemorate the end of the conflict. You cannot bring animals over the green line. It’s time to cross the green line. I present my passport at the border checkpoint of Cyprus. I am allowed to pass without any delay. 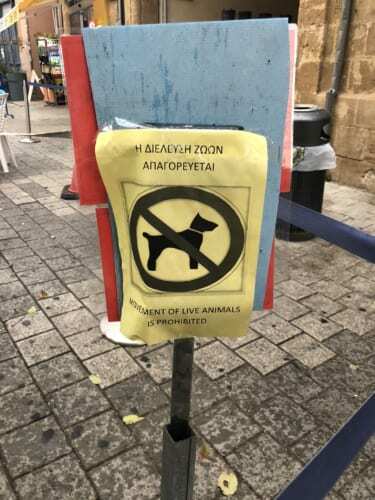 I leave Cyprus. I enter the green line zone. 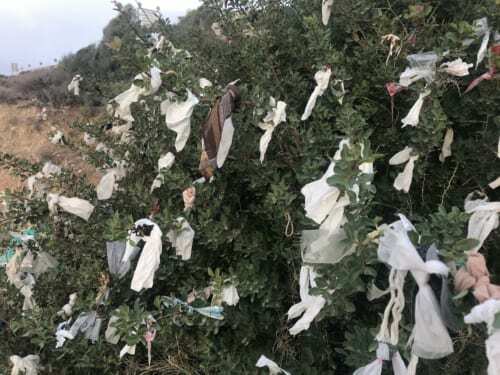 From here to the border checkpoint of Northern Cyprus there’s about 100 meters that belongs to neither country. There are buildings, but no one lives in them. What’s that? A cat! 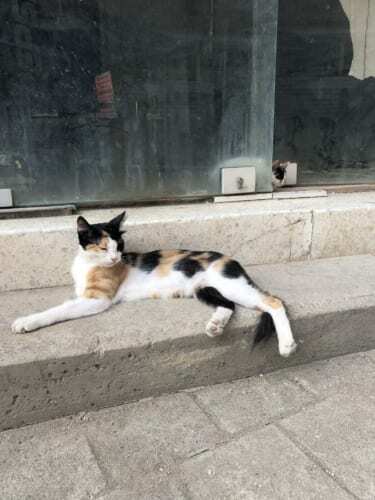 Among all animals, it seems that only cats are allowed to live in the green line zone and travel freely between the two countries. Now, I’m entering Northern Cyprus. People waiting for inspection at the border checkpoint. There was quite a line-up, but it moved smoothly and no-one seemed nervous. The passports are not stamped with any entry or exit stamps. And no one was checking cash. It seemed more like the ticket counter of a theme park. 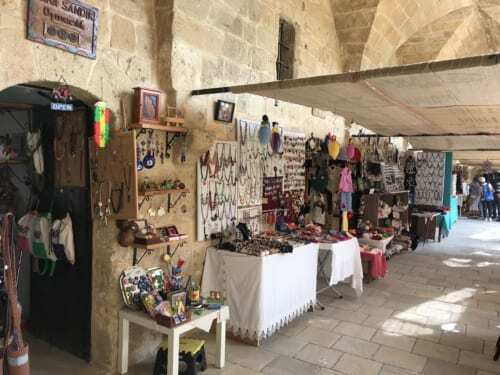 I entered Northern Cyprus on foot without any problems. There is no ccTLD for Northern Cyprus, which is not acknowledged by nations other than Turkey. In Northern Cyprus, they are using “.nc.tr” which is a second level domain of the “.tr” assigned to Turkey. 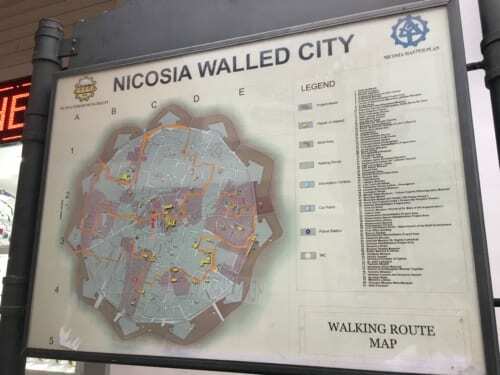 So, I’m going to explore Lefkoşa (the Turkish name for Nicosia), the capital of Northern Cyprus. 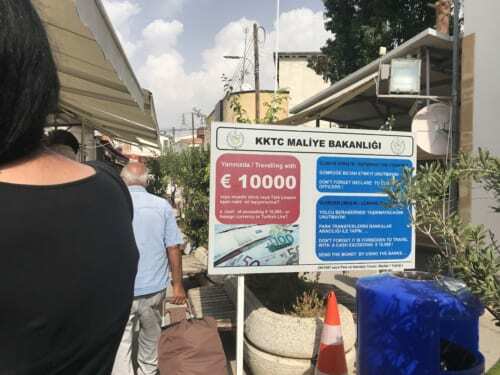 Northern Cyprus belongs to Turkey, but you can use euros without any problem. 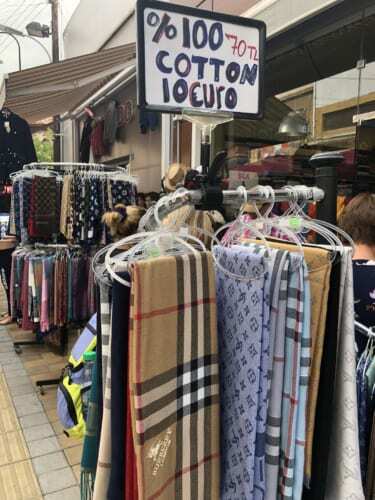 Walking towards the Selimiye Mosque, a famous sightseeing spot of Northern Cyprus, I spotted many shops selling fake brand items. 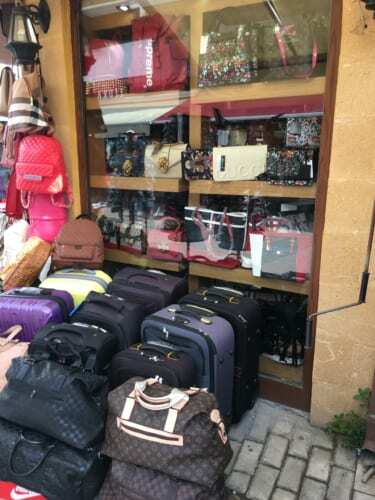 There were many ordinary shops and restaurants too, and I was surprised that the shops selling fake brand items seemed very high end. The man running this shop says “Japanese people are smart and their ancestors were samurai so I’m afraid to make you angry”. 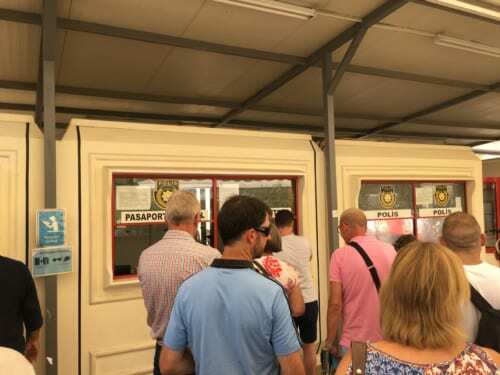 Finally, I arrived at the Selimiye Mosque, all the while shocked at the hordes of fake brand items sold in Northern Cyprus. It used to be called the Cathedral of Saint Sophia. The largest gothic church left on Cyprus is being put to a different use. 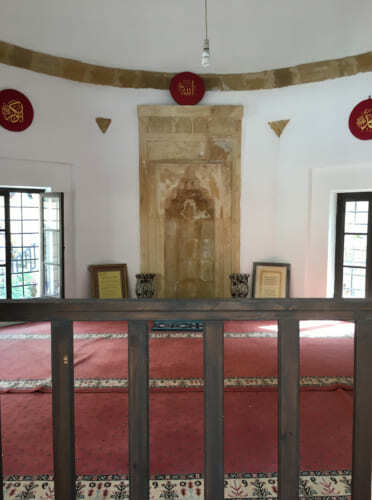 The red flag on the left represents the Republic of Turkey, and the flag on the right represents the Turkish Republic of Northern Cyprus. 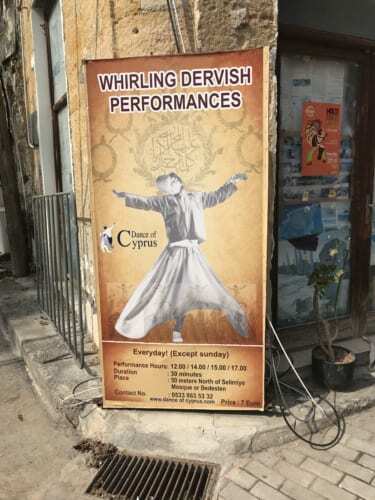 Within the mosque it seems that a “Whirling Dervish Performance” is about to start, this kind of dance originates in Turkey. If I miss it, I doubt I will get another opportunity, so I decided to go in and watch. The entry fee is 7 euros. The performance begins. The two men are just spinning. There are brief intervals, but immediately, without missing a step, they start spinning again. For about 30 minutes they do nothing but spin around. If you watch them your eyes will start spinning too. With my eyes going around so much I started getting hungry. Speaking of Turkey, Kebabs. 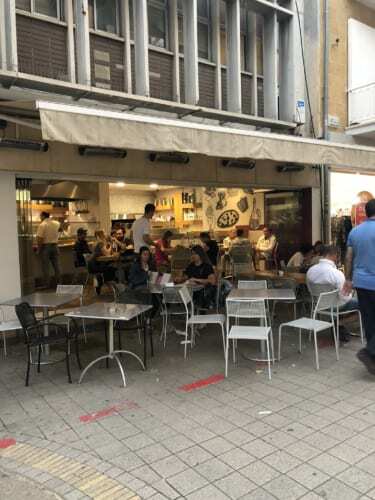 I found a kebab restaurant with an open terrace near the mosque called “f.kelebek papillio”. 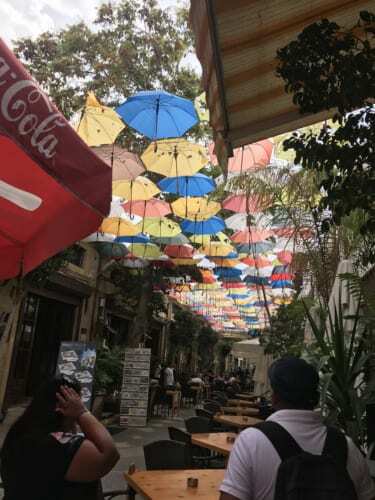 An alley with a roof made of umbrellas. The shops on the other side have no people. 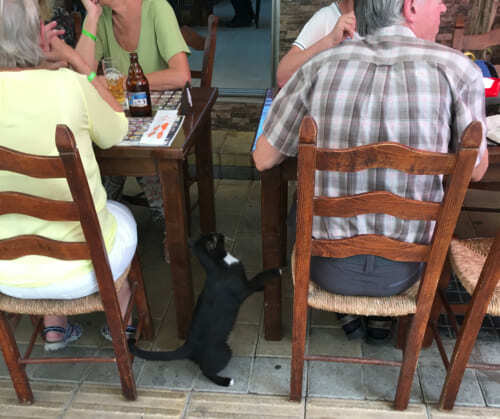 As the restaurant seem to be popular with humans and non-humans alike, I decided to go in. 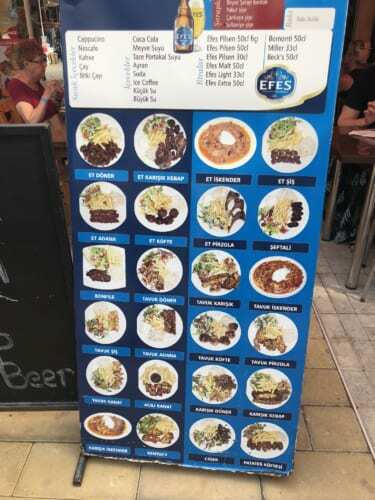 I ordered a kebab, fries, salad, nan and rice set, called ‘karışık döner’ for 6 euros and a cola (1.5 euro). In Northern Cyprus it’s not “COLA” but “KOLA”. And beer is called “BIRA”. 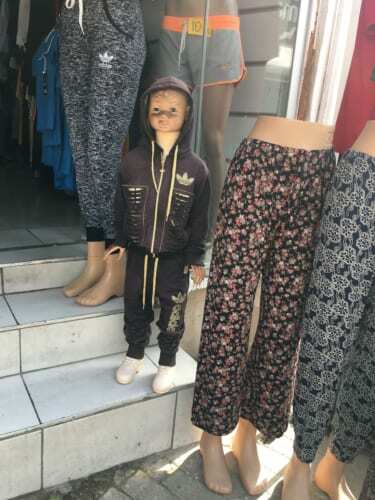 Its 3 euros. 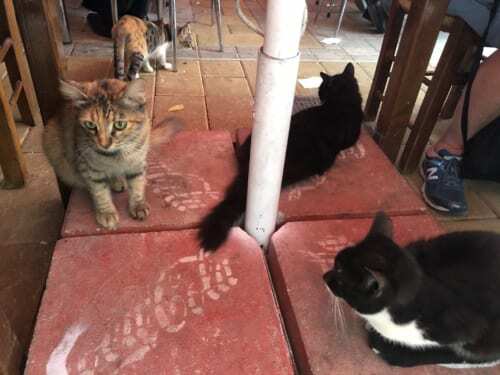 Some cats are hanging out under the table. Is it ok to give food to the cats? Glancing at other customers, they seem to be handing out kebabs without hesitation. Alright then! And… just sincerely wanting to take a picture of the cats, I held out the kebabs to them, and they battered my hands and scratched me. They were not intentionally naughty, but they are half feral and their claws very sharp. Fortunately, my wounds healed without gangrene, but next time I’ll keep in mind that its safer to put the food on the ground rather than in my hands. 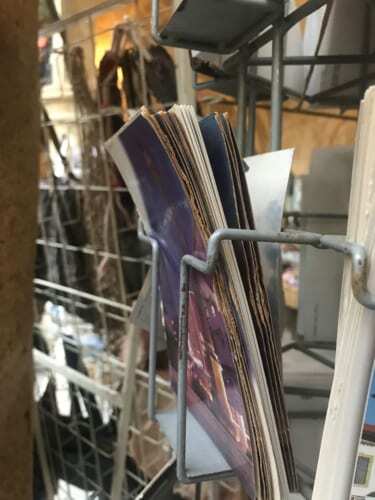 Other customers placed it on the ground. 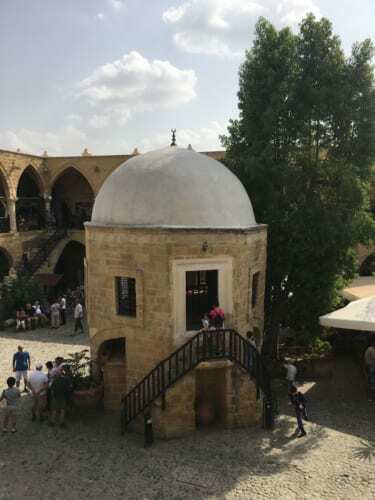 Next, I head to the largest Caravansary (Caravan Inn) in Cyprus, the Büyük Han. Our captain (president) who likes RPG said “You must stay at a Caravansary otherwise your HP (health point) and MP (magic point) won’t recover. I arrive at the entrance. Going in feels like entering a movie set. 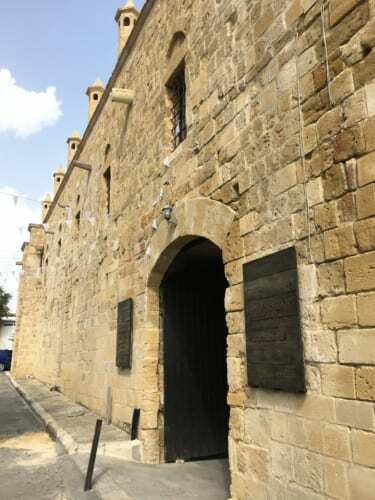 This is said to be the most beautiful building on Cyprus. 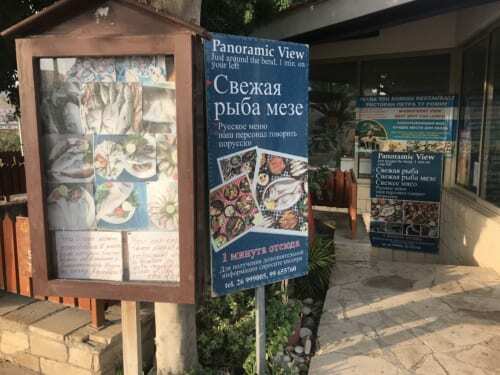 It has recently been renovated and includes souvenir shops, restaurants, cafes etc. 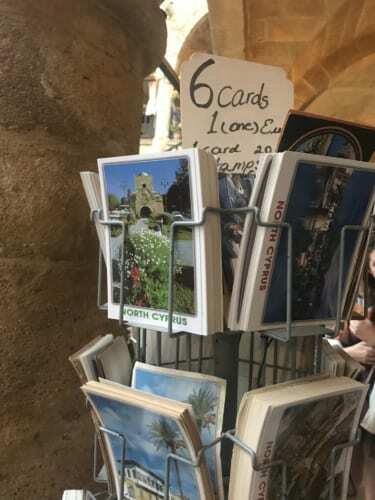 Six postcards on sale for 1 euro. 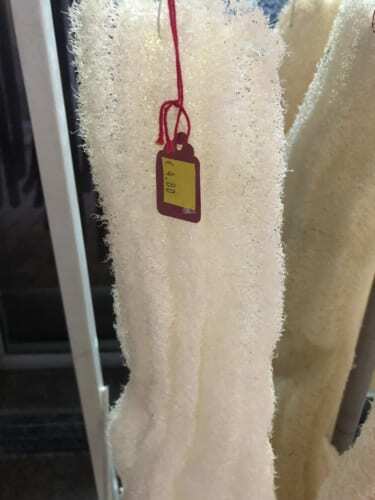 These seem to be “vintage” items. On the subject of postcards, they used to be a staple souvenir, but now few people buy them. 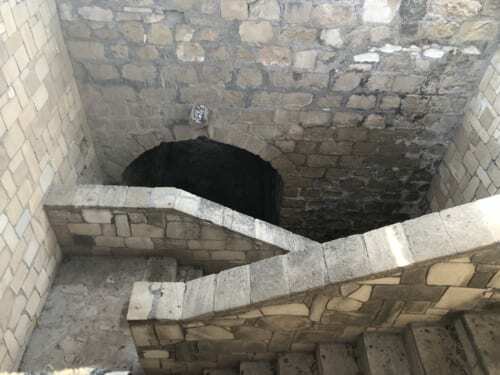 The most interesting thing about Büyük Han was the fortress in the center. I have seen it in RPG. I want to try going inside. I couldn’t go inside, but I could peek inside from outside. 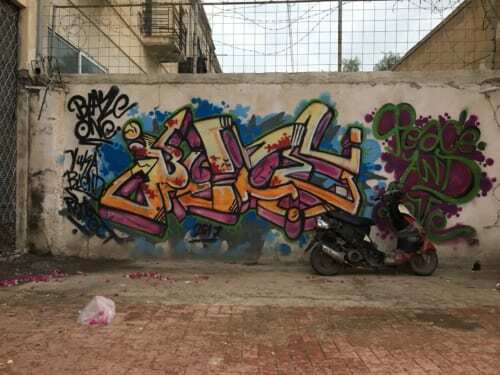 I was wondering if the landlord used to keep an eye on the entire Caravansary from here. 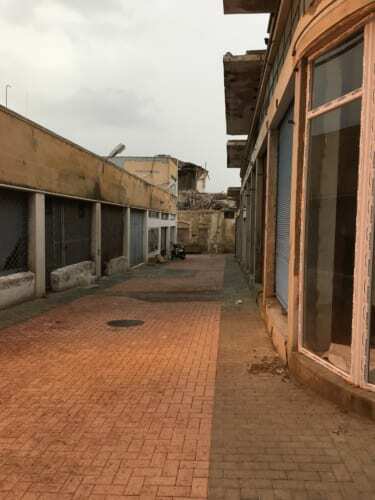 In recent years Northern Cyprus is considered a safe city filled with tourists, however, there are deserted areas with half ruined buildings which if you wander into you will soon feel unsafe. 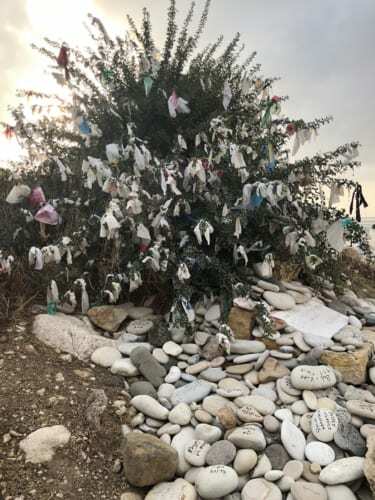 As Northern Cyprus is not recognized as a country, the Japanese government has no diplomatic relations with it, and there is no Japanese Embassy. 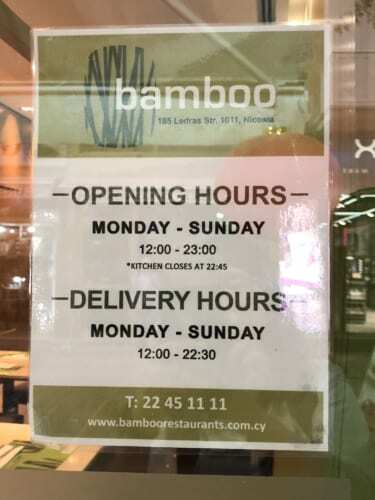 As well, please note that there is no Japanese embassy in Cyprus either because the Japanese embassy for Greece is in Athens. It’s getting dark, and since the HP and MP of the captain of our troops has recovered, I will return to Cyprus. Leaving Northern Cyprus and re-entering Cyprus. 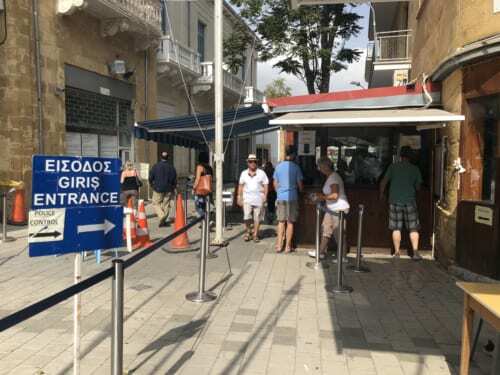 I repeat the routine in reverse to return to Cyprus. 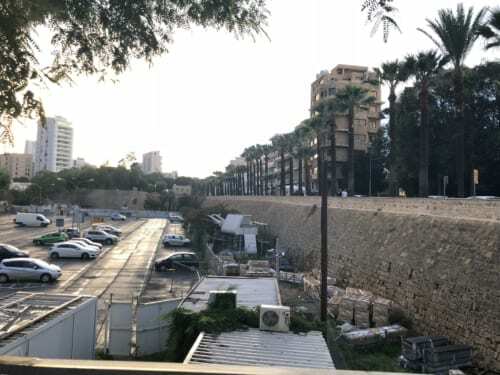 This is a castle wall from the old city area. The total length is about 5 km. 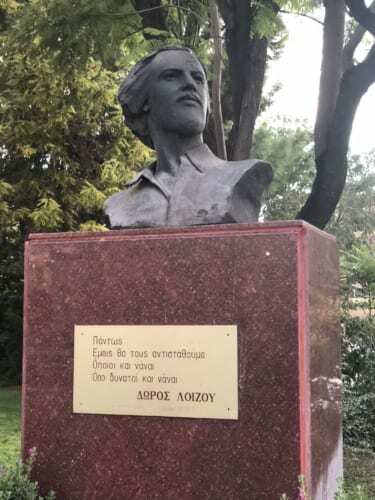 A monument for ΔΩΡΟΣ ΛΟΙΖΟΥ (Doros Loizou). （※place）。Mr. Doros Loizou, who is not so famous in Japan, is a politician from Nicosia born in 1944. On August 30th, 1974, when he was a leader of the Social Democratic Party, he was murdered by an armed group. Besides political activities, he also translated foreign literature and wrote his own poetry collection. After his death, this poetry collection was translated and published in Greek and English. 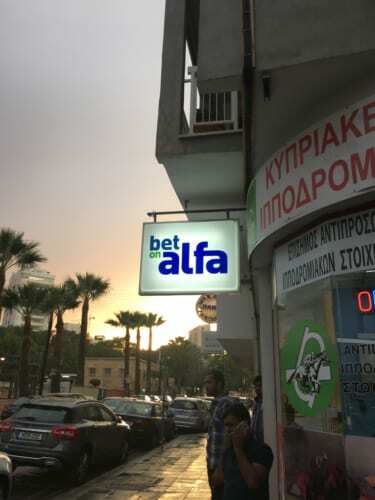 “Bet on Alfa” is a sports betting shop licensed by Cypriot National Gaming Association that currently has 66 branches in Cyprus. Football, basketball, volleyball, tennis, cricket, rugby, snooker, American football, Formula One, World Cup, European Football Championship etc. are available for making bets. 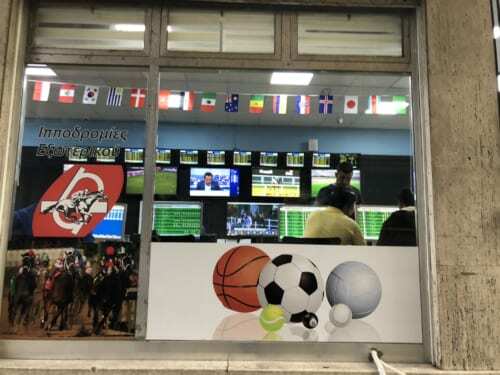 Strangely, you can even bet on the Eurovision song contest. 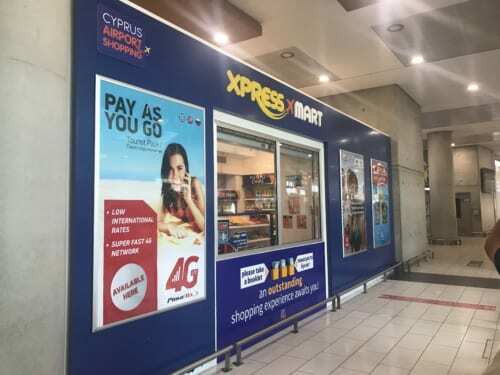 You can buy a SIM at a kiosk just outside the gate at Larnaka International Airport. 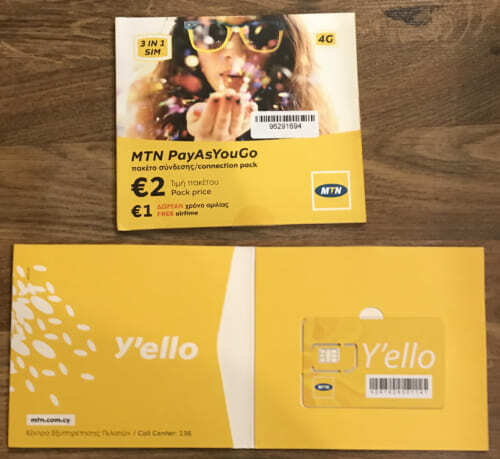 The communications company is MTN. 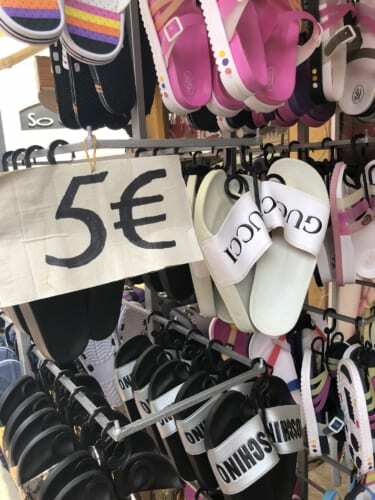 The cheapest price is 15 euros. If you ask the clerk, he / she will activate the prepaid SIM card, enable the internet package, take care of all settings etc. The result of the speed test was 13 Mbps. Although Wi-Fi rental services for going overseas are on the rise, some areas are still not covered. In that case, consider purchasing SIM locally. 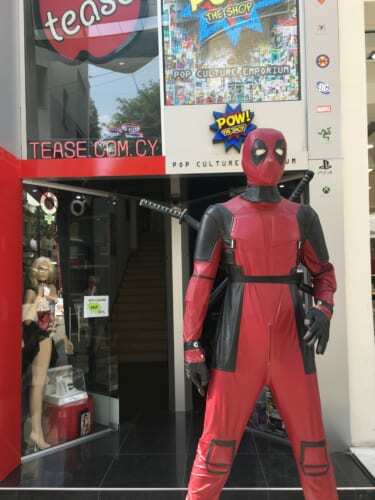 Various places use the “.com.cy” domain, restaurants, event venues, schools, retail stores etc. 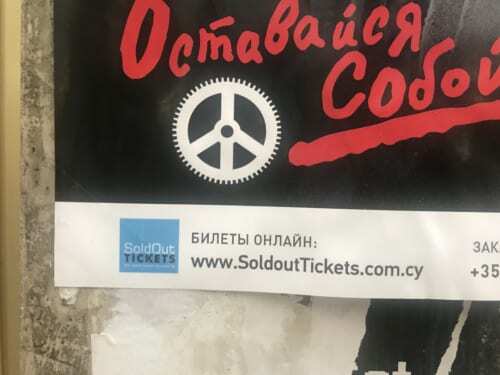 A ticket sales site, for plays and concerts. 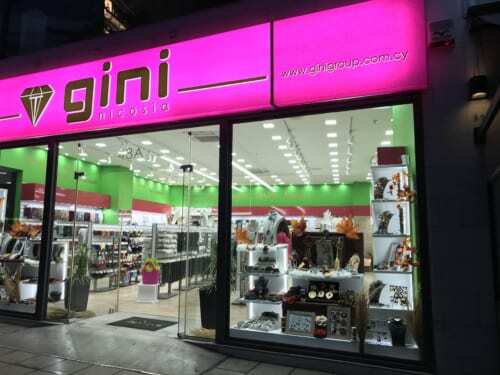 A site for finding stores on Cyprus. 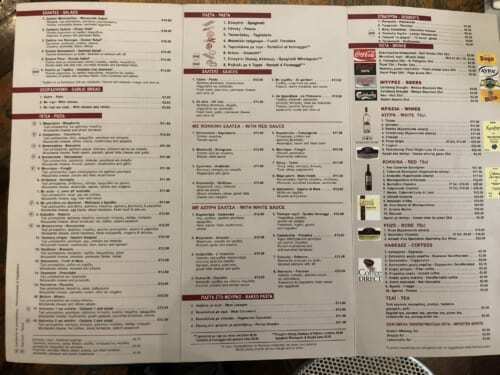 They also have a lot of information about discount coupons. A vocational school for aviation / travel.